Discussion in 'The Snug' started by Chippy_Tea, Oct 18, 2018. The moaners have again "persuaded" a company to re-brand calling mansize sexist, have these people nothing more important to do. 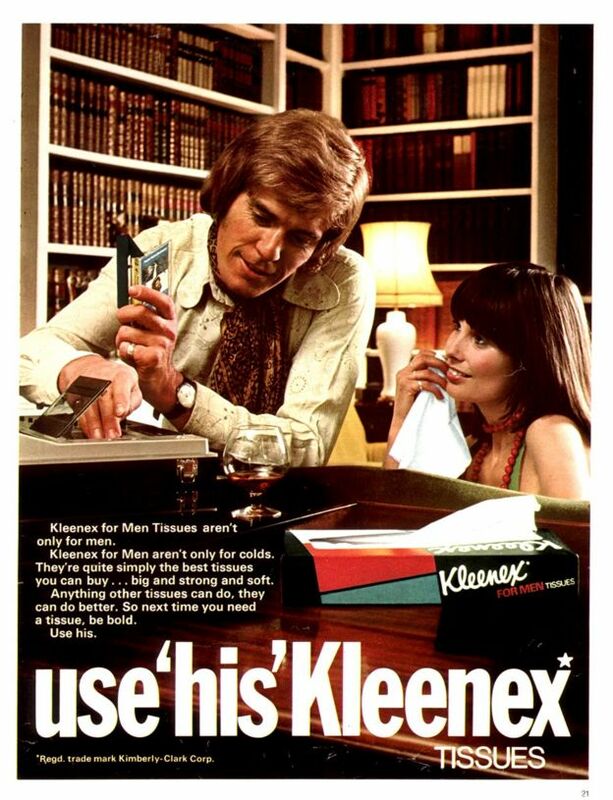 Kleenex For Men first launched in 1956, offering an alternative to large cotton handkerchiefs that were still popular at the time, and claiming to "stay strong when wet". One customer questioned the firm after her four-year-old son asked if "girls, boys and mummies" can use them. We should boycott Kleenex products for being spineless and stupid! They should have made a new brand "Woman size" they missed a trick there. Real men use cotton handkerchiefs, not those toddler tissues! Huzzah! NO not snot filled snot rags. I've never liked the idea of a clothe hankie being used to blow one's nose, especially during flu season when the color could be green--just kind of gross since I didn't grow up with the idea. I don't want that thing in my pocket and I don't want it in the washing machine, not ever, with regular clothes. I suppose relegating it to the rag pile might be okay once it's washed with like items only. Facial tissue (Kleenex) is waay too flimsy (explodes out tiny pieces all over the place). I find that a half sheet of paper towel or a paper, food napkin is better. I'd like to market the paper towel as "Super Man Tissue." Don't have to change a thing. Just re-wrap the paper towel in a different package. You could even leave it in its round, rolled form. Anyway, it's not like the package said, "Women are terrible people." It was only referring to the fact that males are generally bigger in body mass. There are men and women on this planet and there are differences. And Kleenex was only doing it to sell more Kleenex, relate to a specific market. Oh, well. There's this Hungry Man stew campaign, don't know if it's going on still here or if you've heard of it. Showed large men eating larger cans of stew than previously, that kind of thing. That'll have to be changed to "Hungry Person" stew. I share your feelings on cloth hankies i couldn't imagine blowing my nose on a hankie either full of wet snot from the last time i used it or rock hard dried snot from the last time i used it hours before. Absolutely ridiculous, I suppose we'll soon have to refer to this as a personbird ? That's funny. I think the bird community will be up-in-wings over that though. Edit: occasionally I will miss the meaning because of slight differences between the UK and the US as when reading a joke or a comment here. Sometimes it is difficult to discern so bear with me. All people should be respected and this doesn't disrespect. Come out with a women's version. In any case, these same issues are alive and well over here too. If the end goal is to eliminate all differences between the two sexes then that would not be correct because there are. I think that's good meaning it's more interesting having differences. Why am I not offended by female oriented/female only stuff? A little help here because I don't think the way the objector thinks (wanting to do away with man tissue). Its just some sad waste of space moaning because they can i bet they think they have done the world a favour by getting them to change the name, people like this really do boil my p**s.
I’m going to write to Mothercare as their name suggests a Mother cares more about her child than the Father. I’m thinking ‘Parentcare’ would be more appropriate. Should only cost them a few million to rebrand every store. ‘She’ and ‘The Lady’ magazines also require some direct action as they’re exclusive and don’t get me started on Ladybird books. Starting tomorrow night, when I’m going out, I will be using the women’s toilets if the men’s is busy on the basis that I will be presenting as gender fluid. The world is very slowly going completely mad. You are not wrong there GS. I’m going to write to Mothercare as their name suggests a Mother cares more about her child than the Father. I’m thinking ‘Parentcare’ would be more appropriate. Should only cost them a few million to rebrand every store. GhostShip and Oneiroi like this. I really object to the term 'menopause' as it implies men are responsible for the ending of a woman's ability to procreate. Like we did it to them. It should be renamed 'womenopause'. Don't get me started on menstruation. There’s enough real sexism in the world that going looking for it where it isn’t there is pretty stupid. Ironically the name Manchester comes from a Latinisation of the Celtic word Mamucium. Mam as in mammary as in breast. Because there was a nearby hill that looked like a breast.